I am a little late on my update. Things have been hectic and it’s hard to find free time. I did not meet my investment goal this quarter. On the contrary I sold a portion of my portfolio. There are two major life changes I am expecting this year (expect a post or two in the future). Given the nature of the change I decided to liquidate some of my portfolio. Additionally, during my highflying day-trader days, I had raked up some major losses (pharma). Some of these companies went bankrupt this year. Taking advantage of these losses, I decided to close out few of my profitable positions. I had to expend some of my investment money for moving expenses, repairs and closing costs. However, I was successful in meeting my investment target for my IRA account. 2018 has been spectacular in terms of dividends. The biggest surprise was my Roth IRA. This was my first year investing in Roth IRA. One of the funds I chose was Vanguard Wellington Fund (VWELX). It’s an actively managed fund with exposure to stocks and bonds and hence well suited for IRA. 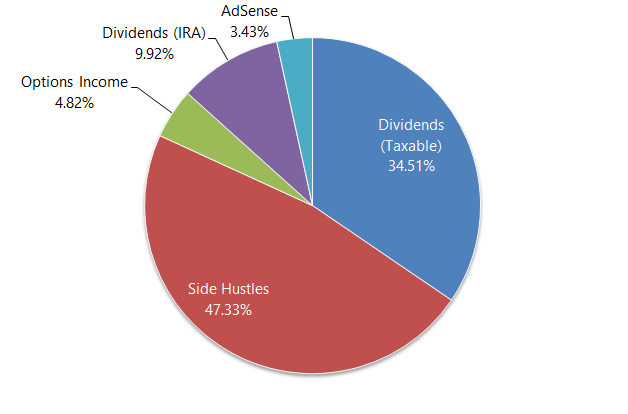 VWELX had a huge distribution in Q4 and bumped up my overall IRA dividends for the year (18.25%). I ended up with $1,560.84 in dividends for 2018. That's a 169.79% increase in dividend as compared to 2017. As I mentioned in my Q3 update I have switched jobs and I no longer have the time for stock picking. Luckily investing in index ETFs does not require too much time. We have started renting again, after much deliberation we decided to sell our home. I had to expend some of my investment money for moving expenses, repairs and closing costs. In addition, for a period of time we were paying rent and mortgage. Considering these additional expenses I was unable to hit my investment goals for Q4.